Early detection of cavity can avoid dental decay and root canal. Best Way to Deal with Early Cavities? Let’s define what a cavity is? Basically, a cavity is the loss of some part of the tooth due to decay because of the acidic reaction that demineralizes the crystalline structure of the tooth. However, there are early signs of that decay that can be detected which only affect the outer covering of the tooth – the tooth enamel. While still confined within that layer, the tooth structure can be re-strengthened externally by means of fluorides or any substance which promotes a re-mineralization of the weakened structure. 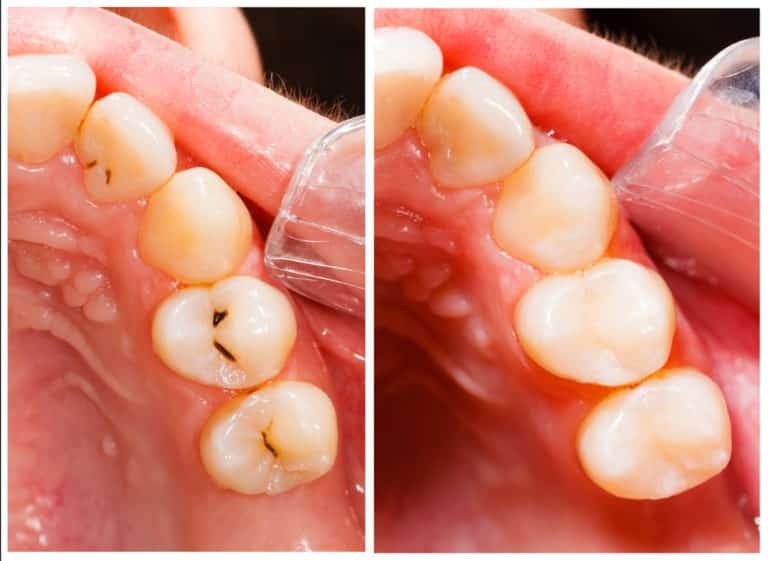 When left unnoticed and unaddressed, that decay will then extend beyond that outer layer and into the inner layer of the tooth which makes up the bulk of the tooth which is called the dentin. It is then when that process “branches out” and the decay spreads deeper into the tooth and leads to a softening of that layer. At some point, the outer covering of the tooth loses support and collapses. That is what most Dentists consider as cavity and this is when patients must seek out the dentist to restore the broken part of the tooth. In some cases, however, the decay may go so deep into the tooth without the outer layer being broken until the pain is felt. That pain is a signal that the pulp (‘nerve”) of the tooth is reached and, in that case, a root canal treatment would be necessary. So, to answer the question, the best way to deal with early signs of dental decay is to actually have your dentist detect them. If you visit your dentist regularly every 6 months, dental decay can be detected in its early stages and treated before it spreads into the deeper layers. Early cavities can be detected before any pain is felt and treated by conservative and minimally invasive restorations on which modern day dentistry revolves around today. If you’re experiencing tooth sensitivity on a daily basis, schedule an appointment with your dentist in North Plainfield NJ today to get it treated! Located at the border of North Plainfield next to Green brook and Dunellen just off Route 22W, we at Dental Designer provide comprehensive dental care for our patients.